Published December 26, 2016 By Anna T. This post may contain affiliate links. Regardless, I only recommend sites I've researched and/or used and trust. At the end of each year, I look back through the blog posts here at Real Ways to Earn and make a list of the most popular ones. The posts that end up being the most popular are often also the most helpful. Even if you're a regular reader, There's a decent chance you missed some of these posts. So, I hope you find something in here that's new to you and helps you in work at home job search for 2017! The new year is right around the corner now, and I know many of you have some serious work from home goals to reach. The blog posts below were selected as most popular for the year based on social media shares and page views. Hope you enjoy! 20 Work at Home Jobs Paying $20 An Hour Or More – This post was intended to help people looking to work from home and make big bucks. You'll see that the majority of the jobs posted are not entry level, but still, it's a good way to see what industries are better paying. Work From Home Jobs For Smartphone Users (No Computers Needed) – Seems like these days most people are accessing the internet from their phones. And due to that, I get a lot of reader requests from people looking to use their phones to do online jobs. In this post, I've found several ways you can do just that. Can You Really Get Paid to Answer Emails From Home? – Another popular request. A lot of readers ask me how they can work at home simply answering emails. While I don't see these jobs often, I was able to come up with enough info and resources to fill a blog post on the topic. 9 Ways to Get Rewarded For Using Your Fitbit – Everyone has a Fitbit these days (including me), and there are a lot of ways to get rewarded for using them online. This post was super popular when I originally published it in January of 2016 since that's the time everyone is eager to get fit! 4 Sites That Pay You Over $100 To Write – If you're looking for a couple of online sites to send writing submissions, and get paid well for them, this list may help. Use Your Voice to Make Money Online With Voices.com – This blog post has info on getting paid for voice overs via Voices.com. I was really surprised by how many people showed interest in doing this. 33 Work at Home Job Search Resources That Are FREE To Use! – I wrote this post for anyone looking to find legit work at home online without paying. As in, people who don't want to sign up for paid membership work at home job search sites like FlexJobs or Virtual Vocations. And even if you are members of those sites, these resources should still help you. 5 Legitimate Work at Home Test Scoring Jobs – Getting paid to score student tests online is a legit way to work from home. In this post, I've listed 5 reputable companies you can sign up with to do this. 3 Ways to Get Paid For ESL (English Second Language) Tutoring With No Experience – Many ESL tutoring companies require past experience and various certifications before they'll let you work for them, but not the three listed in this post. 5 Work at Home Virtual Assistant Jobs For Beginners – This post is for anyone who wants to work at home as a virtual assistant for a company that accepts beginners. Luckily it wasn't hard to find a few options here. So there you have it! Please let me know in the comments what you’d like to see more information about in 2017. 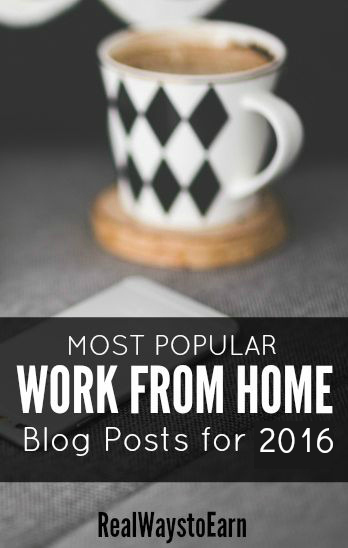 Ready to Set Yourself Up For Work at Home Success Next Year?